2012 has been a year of heated controversies, polemics and human rights violations for the LGBT community in Lebanon. In May Human Rights Watch denounced the performance of invasive tests to determine homosexuality on detainees and ordered by the Lebanese judiciary on the basis of article 534 of the Lebanese penal code – a legislation that precedes the Lebanese Republic by decades – that criminalizes homosexuality. The fact that the infamous tests were still being performed as a matter of routine and people detained on suspicion of homosexuality – obviously, without clear guidelines – prompted Lebanese NGO Legal Agenda to organize the seminar “Tests of Shame” on that same month at St. Joseph University in Beirut. At around the same time, Lebanese Medical Society also held a discussion in which they concluded that the tests had no scientific value. Legal Agenda expressed their concern over how the ultimate goal of the tests is nothing but to humiliate and intimate detainees arbitrarily and in spite of the fact that a judge in Lebanon had ruled previously against the penalization of homosexuality on the sole basis of the article in the penal code. In July a new incident took place, when media celebrity Joe Maalouf and his show “Enta Horr” on Lebanese MTV channel prompted the arrest of nearly forty men at a cinema in Beirut that is known as a place for homosexual cruising. Earlier in the year, Maalouf had also exposed in his infamous show homosexual men at a similar venue in Tripoli, North Lebanon. Although this incident sparked outrage and it was widely reported outside Lebanon, more men were arrested in the coming weeks under similar suspicions and once again, Lebanese channel MTV had no qualms about releasing their names and exposing them to danger in a country where the rights of gays, women and immigrants are violated with impunity. 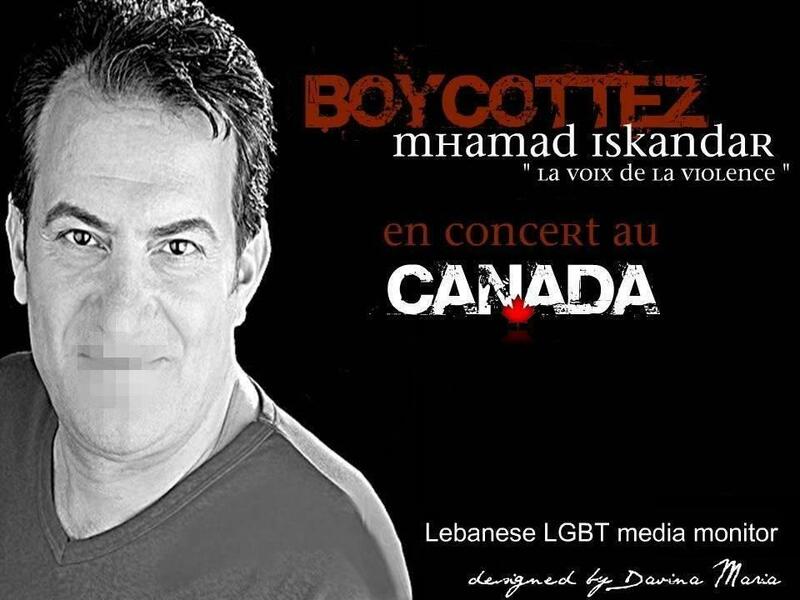 The last straw came earlier in August when the Montreal chapter of Lebanese-Canadian LGBT-rights organization HELEM issued a press release condemning the invitation to perform in Canada in early September, of the Lebanese singer Mohamed Eskander, whose music is well known to be charged with misogynistic and homophobic lyrics and messages. Eskander’s music not only glorifies violence against women and homosexuals but also mocks human rights advocacy. So outrageous is the content of his very offensive music that protests took place in Lebanon in 2010 against his music and also in Denmark. HELEM’s communiqué was reported by Bikyamasr.com and by Lebanese channel LBC on August 22. According to the organization, Eskander’s performance would amount to hate speech and would violate numerous provisions in charters of rights from different Canadian provinces and in the Canadian Criminal Code. HELEM mobilized promptly with the support of media allies in Canada to protest the performances. The venues in Montreal, Ottawa and Windsor where the singer was to perform in late August and early September, were notified about the intention to protest and the condemnation over the performances and they committed in writing to not allow him to perform two numbers in particular, believed to encourage violence against homosexuals and women. Eskander’s son and producer, Fares Eskander, spoke recently to Lebanese daily An-Nahar expressing that he was ashamed about homosexuals being in his father’s audience; confirming the activists’ suspicion that the singer remains unrepentant in spite of the campaign. This was reported by Bikyamasr.com on August 31 and the campaign was hailed as a partial success by the activists. On September 2 it was reported by the Lebanese LGBT Monitor – an online advocacy platform – that Eskander did not perform in Windsor on August 31, neither in Montreal on September 1. The venue in Ottawa where he was scheduled to perform on September 2 announced via social media that his performance had been postponed, without specifying a date. It had been said initially about the campaign that it was only a partial success because this advocate of violence and sexism would be allowed to perform anyway, profiting from Canadian venues, in order to continue producing his offensive material in Lebanon, where he goes unchecked and uncensored, although it seems that the campaign was more successful than expected. GayStarNews.Com reported yesterday Canadian authorities denied Eskander an entry visa, after a successful campaign led by Lebanese-Canadian LGBT activists and all his concerts were cancelled. Other reports – unconfirmed – suggested that the singer may attempt to reschedule his performances and re-apply for entry into Canada. While it is still unfortunate that Eskander goes unchecked in his native Lebanon, the campaign was yet a remarkable success for those in the Lebanese diaspora in Canada concerned with human rights at home. The hope is that the message sent by the activists with the support of Canadian media and authorities will echo positively in Lebanon and raise awareness about the importance of preventing advocates of violence and discrimination to take to the center stage of the arts, influencing many negatively. While it is still unknown how this will have an effect in Lebanon, it remains altogether true that the Lebanese public should be aware how what is otherwise normal in Lebanese society – discrimination and sexism – can bring much deserved shame and isolation to a country whose artistic scene features a number of truly talented and socially aware artists that could represent Lebanon better than Eskander’s offensive art. The Canadian public and authorities know this very well; it is perhaps time for the Lebanese to acknowledge it too. "charged with misogynistic", "glorifies violence against women" and "So outrageous is the content of his very offensive music that protests took place in Lebanon in 2010 against his music" are gross exaggerations. If I remember correctly the lyrics meaning was that a woman shouldn't work but should stay in house that everything shall arrive at her doorsteps like a princess. Contradicts gender equality yes, you don't agree with it maybe, but not what is mentioned above.